Dr. Chhabra is a Radiology Resident, Dr. Batra is a Radiology Fellow, and Dr. Mulhern is a Professor and the Director of Chest Radiology, Department of Radiology, Drexel University College of Medicine, Philadelphia, PA. Dr. Torigian is an Assistant Professor of Radiology, Hospital of the University of Pennsylvania, Philadelphia, PA.
Multidetector CT (MDCT) has become the gold standard imaging modality for the diagnosis of pulmonary embolism (PE). 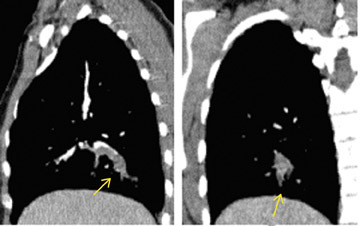 Detection of small emboli in segmental and subsegmental pulmonary arteries is still a diagnostic challenge, however. The reported incidence of isolated segmental PE ranges from 4% to 30% in various series. 1-3 Small segmental or subsegmental PE are of importance in patients with limited cardiopulmonary reserve and for diagnosis of chronic pulmonary hypertension. They may be an indicator of silent deep venous thrombosis, which may predispose patients to more severe embolic events. 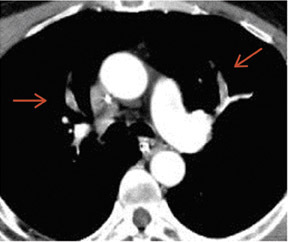 2 This article will present optimal technical parameters and scan interpretation techniques for MDCT evaulation of PE, will review key imaging appearances of acute and chronic PE in small vessels, and discuss potential interpretation errors. 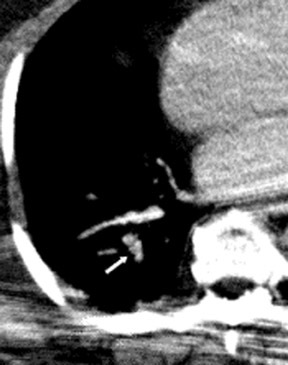 In the era of MDCT, axial image review alone is rapidly becoming not only impractical, but also suboptimal. Using radial multiplanar reformatting of the MDCT data sets offers significant improvement in the recognition of subsegmental PE. 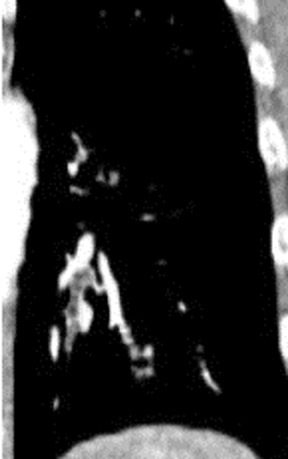 18 Reformatted images through the longitudinal axis of a vessel are often used to overcome various difficulties encountered with axial sections of oblique- or axial-oriented arteries. These images help to differentiate true PE and a variety of patient-related, technical, anatomic, and pathologic factors (Figure 2) that can mimic 6,9,13,14 Multiplanar images are also beneficial as communication tools for our referring colleagues and can enhance the role of the radiologist as part of the clinical team. For documentation and interpretation purposes, it can be useful to subjectively grade the level of contrast opacification as good to excellent, diagnostic but of limited value, or not of diagnostic quality, since it reflects clinical situations. In our departments, we grade the opacification objectively as excellent, good, or poor, depending upon the visualization of small peripheral arteries, segmental arteries, and only central main and lobar arteries, respectively. It is important to also make note of respiratory motion and image noise. 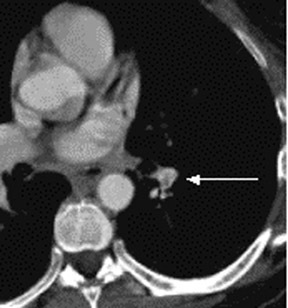 In contrast to acute small PE, there are distinct CT signs that may be seen in cases of chronic PE. 15,16,19-23 It may appear as a complete occlusion of a vessel that is smaller than adjacent patent vessels or as the abrupt cutoff of small arteries (Figure 8). Figure 9 presents an illustration of peripheral intraluminal defects that form obtuse angles with the vessel wall. Thickened irregular small arteries may be seen because of recanalization with or without calcification. 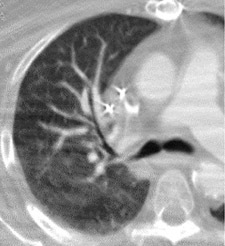 Dilated collateral vessels, such as the bronchial or internal mammary arteries (Figure 8), may also indicate chronic PE. 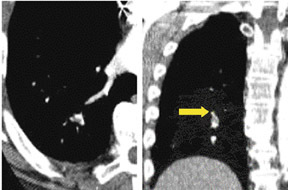 Indirect signs may be seen, such as an enlarged central pulmonary artery with narrowing of peripheral arteries (Figure 10A), mosaic perfusion (Figure 10B), right heart enlargement with wall thickening, and bronchial dilatation. 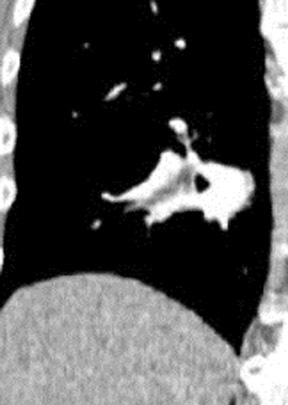 In our experience, compared with CT findings in larger vessels, webs and flaps are difficult to visualize in subsegmental arteries. 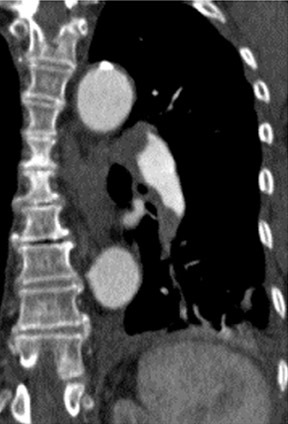 In some patients, an MDCT study may be contraindicated because of the lack of available venous access, renal failure, or contrast allergy. Also, artifacts and mimics should be identified to prevent misdiagnosis (Table 2). 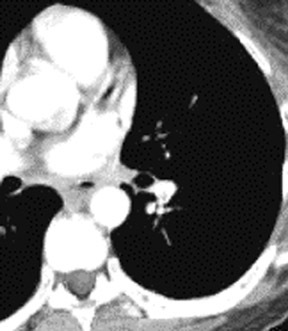 Respiratory motion is the most common cause of artifacts in MDCT PE studies. 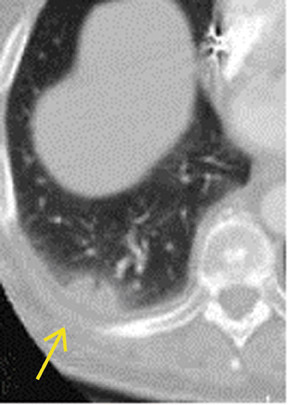 Such artifacts are best recognized on lung window settings as the blurring of vessels and rapid change in the position of vessels on contiguous images (Figure 11). 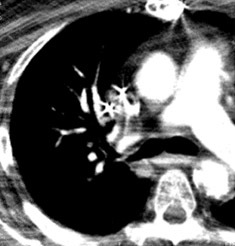 With faster imaging in MDCT, motion artifacts are less problematic. 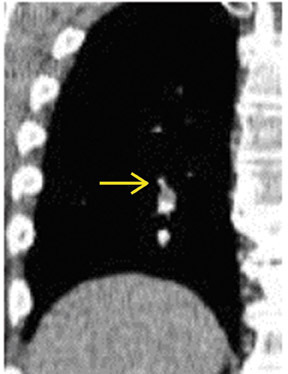 Imaging in large patients is frequently limited by excessive quantum mottle, which leads to image noise (Figure 12). The protocol can be modified by increasing detector width and kVp. However, this increased detector width also decreases sensitivity for the detection of PE caused by decreased spatial resolution. 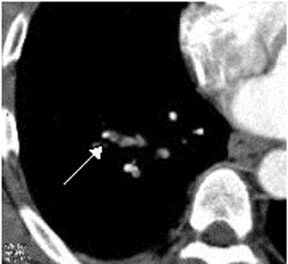 Lower lobe flow-related artifacts caused by admixture of blood and contrast material can result in poor vessel opacification at segmental and subsegmental levels (Figure 13A). A flow-related artifact can be confidently diagnosed by identifying its ill-defined margins. 15,16 This may become pronounced in cases of suboptimal timing of contrast bolus or sluggish flow resulting from underlying vascular congestion, such as in cases of congestive cardiac failure. Edema caused by congestive heart failure can produce perivascular interstitial thickening, which mimics chronic pulmonary embolism. 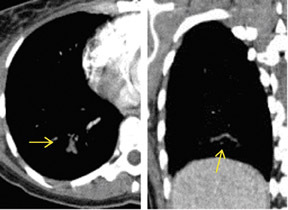 Other CT signs of heart failure (including ground-glass attenuation, diffuse interlobular septal thickening, third spacing of fluid, and bilateral pleural effusions) help in diagnosis. With a 1.25-mm detector width, there is a reduction in partial volume averaging of lymphatic tissue and vessel that can simulate PE. 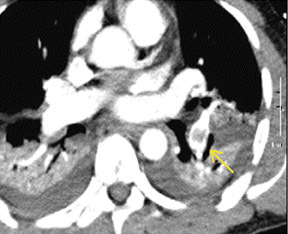 Lymph nodes can be easily distinguished from PE by their extramural location and the normal smooth contour of the contrast-enhanced vessel. 16,24 Multiplanar reformatted images also help in difficult cases. 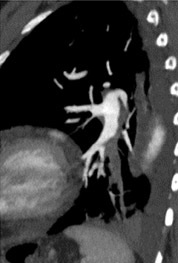 As the images are obtained in the early arterial phase, spurious filling defects may be seen within the pulmonary veins. 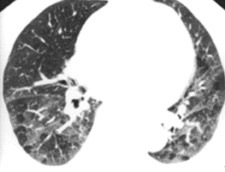 Pulmonary arteries are accompanied by bronchi, whereas pulmonary veins run separately within interlobular septa. 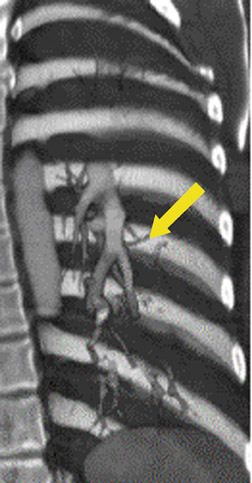 In addition, pulmonary veins may be followed se-quentially to the left atrium (Figure 15). The appropriate window width and level settings are important for identifying small emboli, webs, or flaps. 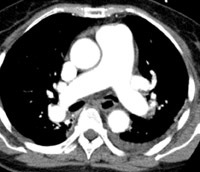 Pulmonary-embolism-specific or bone windows are helpful, especially near the hila, as very bright vessel contrast can obscure small PE (Figure 16). 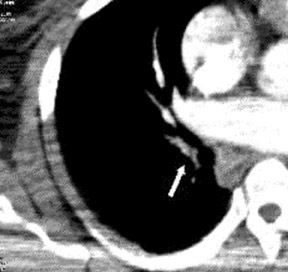 Partial volume artifacts may result in an apparent filling defect that mimics acute PE. A stairstep artifact consists of parallel lines on reformatted images and is accentuated by cardiac and respiratory motion. These artifacts are less apparent with overlapping reconstructions on MDCT. 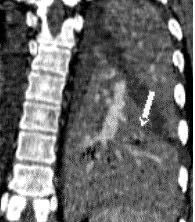 The advent of multidetector row spiral CT has greatly expanded our diagnostic capabilities in patients who are suspected of having PE. 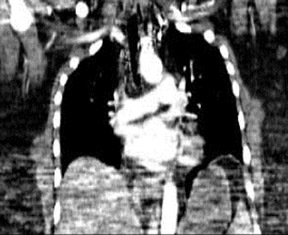 Multidetector CT is an ex-citing modality for the diagnosis of small segmental and subsegmental PE. 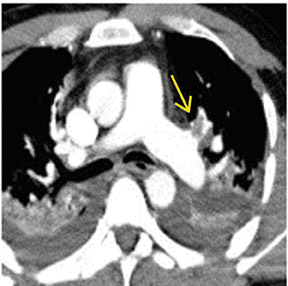 When evaluating small intravascular filling defects, radiologists must be familiar with relevant CT artifacts and imaging pitfalls to prevent misdiagnosis. 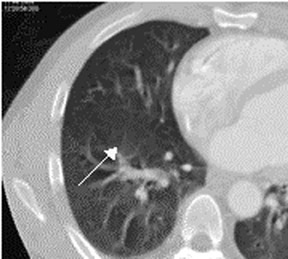 Pulmonary embolism in segmental and subsegmental arteries: Optimal technique, imaging appearances, and potential pitfalls in mul. Appl Radiol.